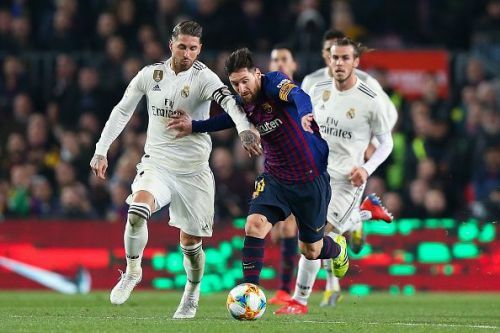 Barcelona and Real Madrid will experience a busy summer as both the teams are looking to strengthen their squad and secure the big names of the futures. Both teams are two of the heavyweights in world football and will try their best to scout and secure the wonderkids to continue their dominance in coming years. While Barcelona are well on their way looking for another historic treble, the Catalan giants will be wary of not making the same mistakes Real Madrid did in the last transfer window. Players like Messi, Suarez, Busquets, Pique, Alba are not getting any younger and they very well know that securing players with potential will help them through the transition phase. Meanwhile, Los Blancos desperately seek reinforcements and Florentino Perez is set to splash the cash on targets chosen by Zinedine ZIdane. Although big names are expected to be their main targets, they very well know the importance of youth in the team. The transfer policy of Madrid has changed in the past few years as well. The club is looking to secure the services of sensational talents around the world. With the clubs targeting players with huge potential, there is bound to be a clash between two arch rivals as there is bound to be some common name on their wishlist. Let us take a look at three talents both Real Madrid and Barcelona are chasing this summer who can shape the future of two clubs. With 16 goals and 9 assists in all competitions for Benfica, Felix is experiencing a meteoric rise to fame. The 19-year-old Portuguese sensation is touted as the 'new Cristiano Ronaldo' for his exploits with his side and garnered attention of top clubs across Europe. Felix can bombard the flanks with his raw pace and energy but can pull the strings at the center of park due to his maturity and vision to pick out his teammates. The ability to create space and find his teammates makes him a huge asset and no wonder Benfica is constantly trying to increase his release clause which is currently €120 million. While Blaugrana scouts were delighted with his hat-trick against Frankfurt in the Europa League last week, Los Blancos are keeping tabs on the Portuguese talent. Aside from the two Spanish giants, most clubs have been scouting Felix for a long time and a huge bidding war for the player is bound to happen in the summer.